Galini Breeze is situated just outside the borders of the village of Agia Galini. Agia Galini was a dormant fishing village once. From the 1960’s the area was favorite among backpackers and hippies; in recent decades more tourists that love some more luxury and convenience found their way to the sunny south coast. The narrow streets adjacent to the port host small shops and plenty of terraces. Approximately 20 restaurants are located in the village and along the pedestrian promenade. Finally, the village offers some cozy music-cafes and lounge-bars. Galini Breeze studios are at a 5 to 10 minutes walking distance from the village and its main beaches, on a gently sloped hill just outside the village. 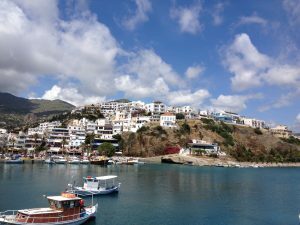 All in all, Agia Galini is a vibrant village, and in addition Galini Breeze offers a private hide away. This is a live webcame image of Agia Galini beach!